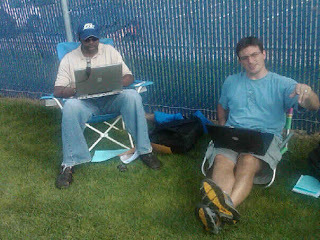 The New Haven Register Blogs: Ramblings from The Runway: UConn media hard at work. This was taken minutes before I burst into flames from the oppressive heat. Next time, I'm bringing an umbrella and chair like Desmond's. Thanks to Pat Eaton-Robb of the Associated Press for the photo. Chip, I meant to ask yesterday, do you currently or do you plan on using twitter to keep us updated throughout the season? I know Desmond Connor from the Courant uses it, but hardly ever updates (his blog on the other hand updates frequently). Also, are you going to be covering all road games this season? I know it was a sensitive subject at the end of last season, don't know if you are even at liberty to discuss. Gary, unlikely on both accounts.